Introducing our new 1/2 HP rocking piston kit. This very powerful unit can aerate up to 3 acres! The rocking piston compressors can operate up to 50' deep. Motor draws 3.8 amps and pumps 5.1 CFM of air. It is a powerful aerator that is competitively priced and don't forget it comes with a great 2 year warranty. Please call us if you are unsure of what kit to purchase and we will be happy to assist you. 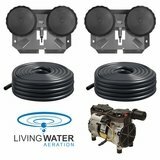 Living Water Aeration pond aerators are efficient, affordable and safe systems for circulating and adding oxygen to your pond. Our pond aeration systems are guaranteed to increase oxygen levels in your pond. Also these systems destratify, prevent oxygen depletion and fish kills. There is absolutely no electricity in the water, our pond aeration systems are safe for any type of water recreation. The only maintenance needed being the replacement of piston cups & gaskets when needed. Repair kits are available on our website here. (a noticeable and sudden drop in air bubbles after a few years of operation is a sure sign that the piston cups need to be replaced). Be sure to clean the inlet air filter on your compressor regularly. Wash dirty air filters in soapy water. Replacement filters are available on our website also. I have a 3 acre pond with a max depth of 20 feet , most of the pond is under 10 feet. My electric source is in a building 150 feet from the pond which is where the electric compressor part will be at. Do i run 1 airline to the pond and split it ? or do i run 3 separate air lines from the building ? The 3 lines from pond edge would be 100 feet , 60 feet and 30 feet. Can I run a larger line from the pump say 500' than branch off a manifold from there? Yes you can, we recommend our remote access accessories when you opt for that set up, have a look at these: https://www.livingwateraeration.com/remote-access-valve-assembly.html https://www.livingwateraeration.com/valveboxes.html This will give you the fittings to complete the job and a valve burial box to keep the valve out of the way. Yes you can run up to 1000 feet of airline per run. For the runs over 300 feet I would recommend upgrading to 1/2" tubing. For the runs less than 300' you can stay with the 3/8" airline. We could customize a manifold for you to accommodate this set up. The lines can be spliced we provide couplings and hose clamps to piece together the splices. i want to control growth of weeds and algee on a ponded river with a shallow dam .can your system benefit me if the river is 4to 6 ft deep within 50 ft 0f shore line . I have windmill by small lake, it's around a 2 to 3 acre, do you have equipment that you can attach to it ?, just moved here in August and neighbors said, a little over a year prior to that, there was a lot of fish that had died. Upon reading about this and why they died off, was to many fish and not enough oxygen. I am looking for information that can help me fix this and to keep it from happening again.